These systems tend to be fantastically complex. One doesn’t have to be intimately familiar with, say, Hertz or Enterprise to rent a car online. But many electronic health record systems have pull-down screens listing each of the 68,000 possible diagnosis codes in the World Health Organization’s International Classification of Diseases and 87,000 possible procedure codes. Ideally, electronic health records would provide doctors with instant access to information and help patients track their medical histories. Such records should be a giant step forward in continuity and comprehensiveness of care. So far, the “cures” are worse than the disease. In June, the Annals of Emergency Medicine published a study warning that the "rush to capitalize on the huge federal investment of $30 billion for the adoption of electronic medical records led to some unfortunate and unintended consequences" tied to "communication failure, poor data display, wrong order/wrong patient errors and alert fatigue." Also this summer, Massachusetts reported that 60 percent of doctors could not meet the EMR mandate and face potential loss of their licenses in 2015. And a few weeks ago, the American College of Physicians pleaded with the feds to delay the mandate's data collection, certification and reporting requirements. Dr. Hayward K. Zwerling, an internal medicine physician in Massachusetts who is also president of ComChart Medical Software, blasted the Obamacare EMR mandate in a recent open letter: "As the developer of an EMR, I sincerely believe that a well-designed EMR is a useful tool for many practices. However, the federal and state government's misguided obsession to stipulate which features must be in the EMRs, and how the physician should use the EMRs in the exam room places the politicians in the middle of the exam room between the patient and the physician, and seriously disrupts the physician-patient relationship." Zwerling's call to arms appealed to fellow doctors to pressure the feds to repeal the mandate. "It is past time that physicians reclaim control of their offices, if not the practice of medicine." Dr. Michael Laidlaw of Rocklin, Calif., told EHR Practice Consultants that he abandoned the Obamacare EMR "incentive" program "when I realized that I spent the first two to five minutes of each visit endlessly clicking a bunch of garbage to make all the green lights show up on the (meaningful use) meter. I said to myself: 'I'm not wasting precious seconds of my life and my patients' time to ensure some database gets filled with data. I didn't go into medicine for this. It is not benefiting my patients or me. I hate it.' I actually refused to take the $10K-plus this year. I have even accepted that I would rather be penalized in the future. What is worth the most to me is AUTONOMY." Electronic medical records can be a tremendous benefit, if adopted organically by physicians and hospitals based on their needs and requirements. But ramming them down the throats of doctors is merely hampering good patient care. Update: Even kids know this is a problem. 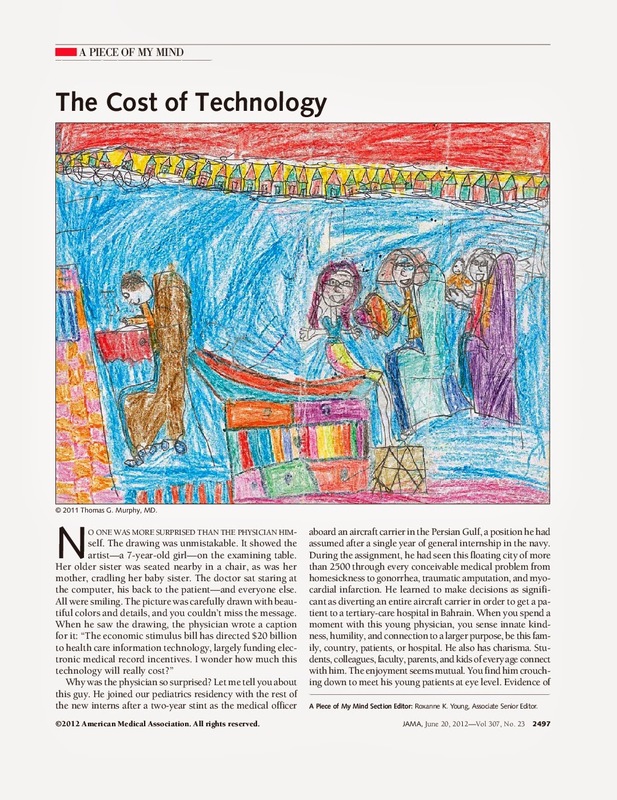 Here's a drawing made by a 7-year old girl published in the 6/20/2012 issue of the Journal of the American Medical Association. No one was more surprised than the physician himself. The drawing was unmistakable. It showed the artist—a 7-year-old girl—on the examining table. Her older sister was seated nearby in a chair, as was her mother, cradling her baby sister. The doctor sat staring at the computer, his back to the patient—and everyone else. All were smiling. The picture was carefully drawn with beautiful colors and details, and you couldn't miss the message.